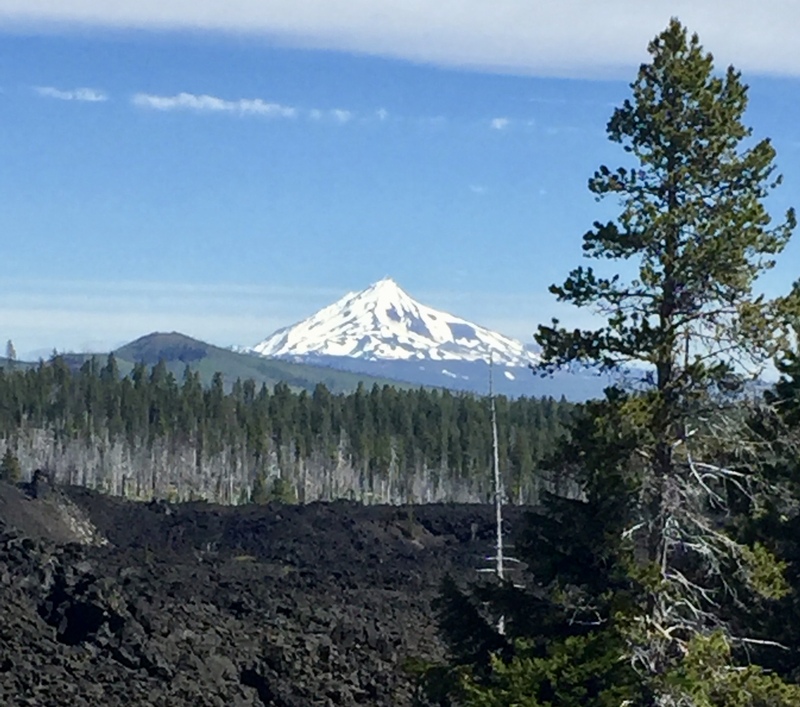 Day 3 - Over McKenzie Pass. Hung out in Sisters for a bit. Up early to finish the climb in the morning coolness. There was actually just 4 more miles of the climb until it leveled out and then a few ups and downs before the top. Traffic was picking up, mostly from the Sisters side. At the top I ran into a number of cyclists riding from Bend. They started even earlier than I did, and rode a lot faster. It was clear and beautiful at the top, with lots of snow still on the mountains. Took lots of pictures on the way down. The view is mostly to the north, so I could see Jefferson as well as the closer peaks. This descent has got to be one of the best in the state. The really fast part is over pretty quick but then it goes on and on at a grade where you can be pedaling at 30 mph. I rode around Sisters a few times before finding a nice quiet cafe on a side street. This town has long ago become a bug tourist destination, but there still are a few local places here and there. I also got a few groceries at their nice, but way over priced, natural food store. Leaving Sisters I expected to find a side road that would get me off of the highway, but it never really materialized. The one road that looked promising was very nice but looped back to the highway after a couple of miles. The views were great though. In my mind I though highway 20 to Bend would be mostly east and the mountains would be at my back. It's actually mostly south and the mountains were in clear view to my right. 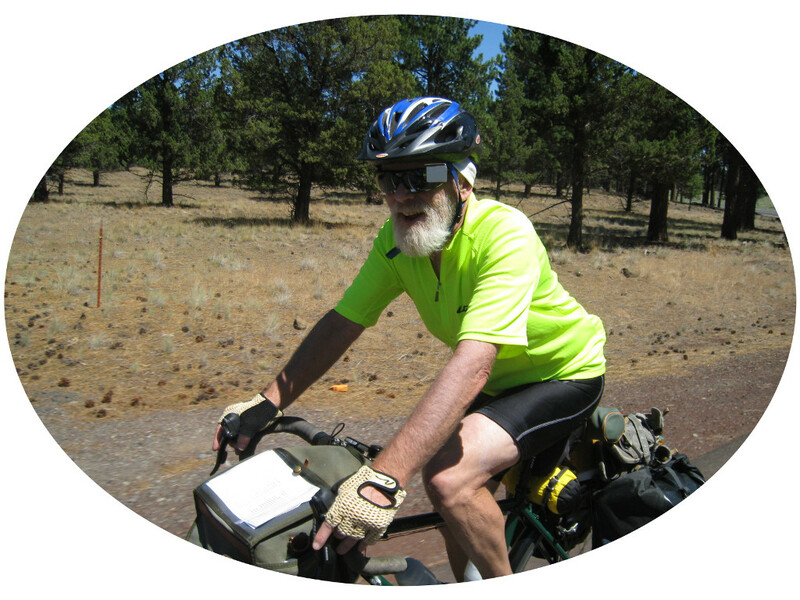 I stopped at a view point and met a young cyclist who was touring on a lightly loaded road bike, even doing gravel roads. We started out together but he was out of sight in no time. I guess you can cover a lot more ground when you can ride fast, but I was quite content to continue my snails pace across the state. Some businesses have started to spring up along the highway at the exit to Tumalo SP. I stopped at a convenience store and had an ice cream and made note of a pizza parlor that I would return to for dinner. The wind was picking up as a rode the last couple of miles to the park. The hiker/biker site was empty except for me and there was some good shade. This is probably the least attractive hiker/biker site in all the state parks I've stayed in, but it was perfectly adequate for the night. Shade, some privacy, toilets close, and excellent showers not too far away. 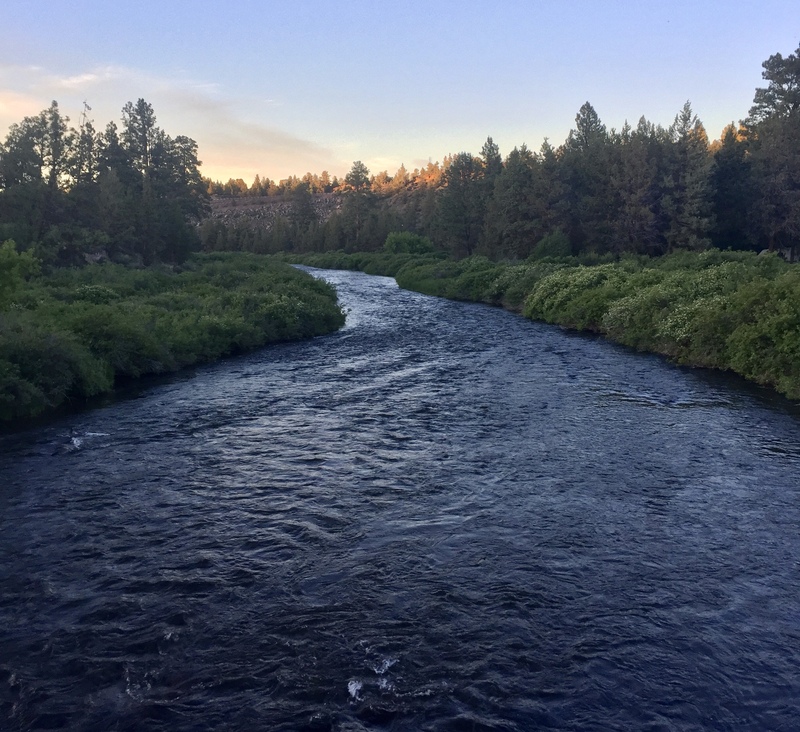 Plus it is a short walk down to the Deschutes River. In the evening I rode back to the Pizza place, into the wind now, which had really good pizza and okay beer. Then back to camp and a walk down to the river to play my flute. The Three Sisters from the east side.